It’s been a while since I’ve written on the blog. First there was the 2012 Hazardous Weather Testbed Spring Forecast Experiment in May and June. Next. I was an invited participant at the 2012 European Severe Storms Laboratory Forecast Testbed in mid June. To end June I spent 2 weeks as a forecaster/nowcaster in Salina, KS for the DC3 Field Experiment. In July I went to the 2012 SciPY Conference, and in August I deployed with the OU SMART-Rs to collect data on the landfall of hurricane Isaac. As you can see, there wasn’t much time left for blogging. Anyways, I’m pretty sure you aren’t here to read about why I haven’t posted. For reasons too numerous to list here, I have been interested in understanding risks associated with high-impact weather. 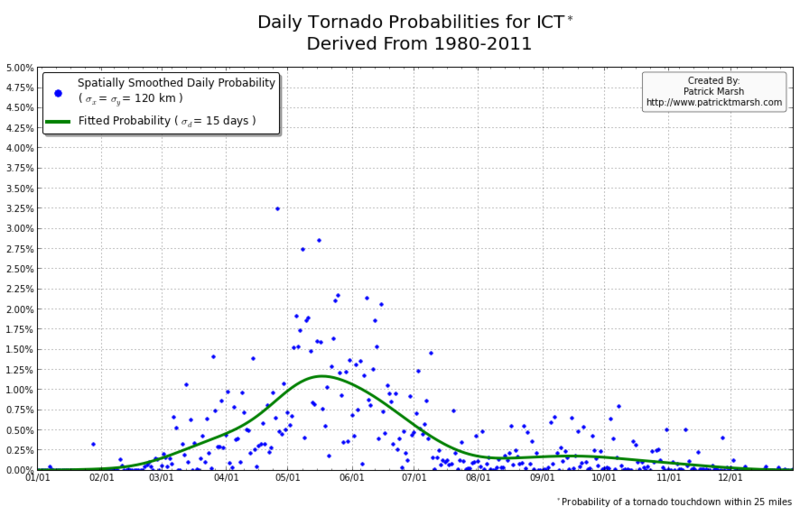 One particular interest of late is the debate between weather enthusiasts regarding the risk posed by tornadoes in the plains to the risk posed by tornadoes in the southeast United States. 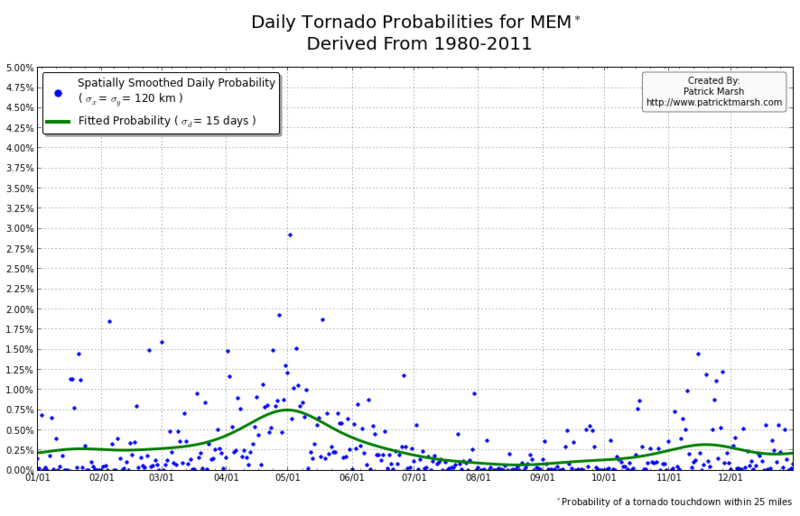 Typical arguments of risk revolve around who has the greatest number of tornadoes, which would seem relatively unambiguous. 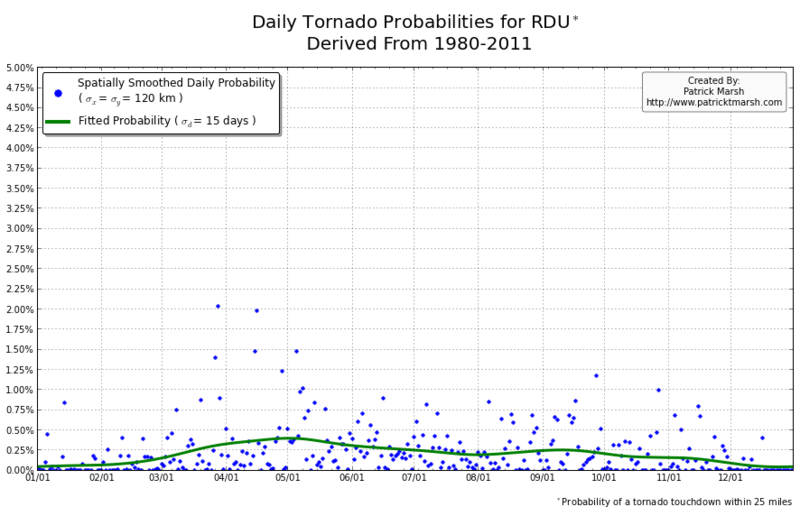 However, because of the relative rarity of tornadoes, even this is rife with controversy. 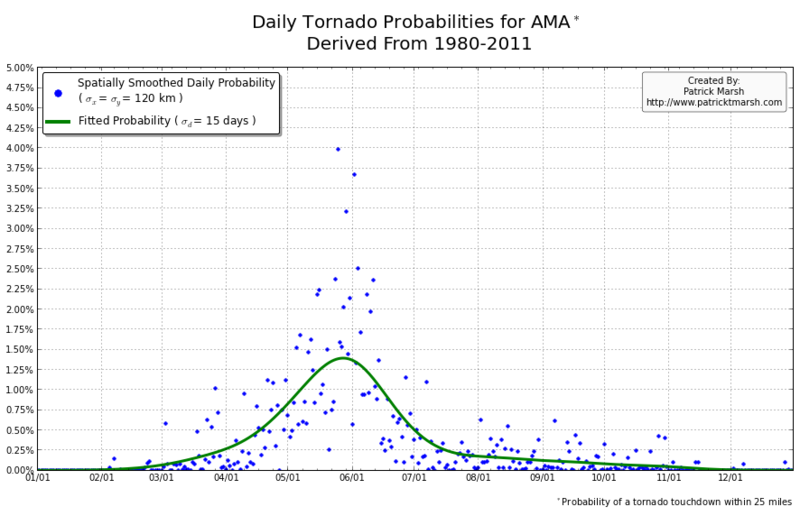 Additionally, people tend to associate tornado risk/exposure based upon the ill-defined “tornado season” of the even more nebulous “Tornado Alley”. Previously, Dr. Harold Brooks of the National Severe Storms Laboratory, put together time series of the annual cycles of tornado, wind, and hail probability. 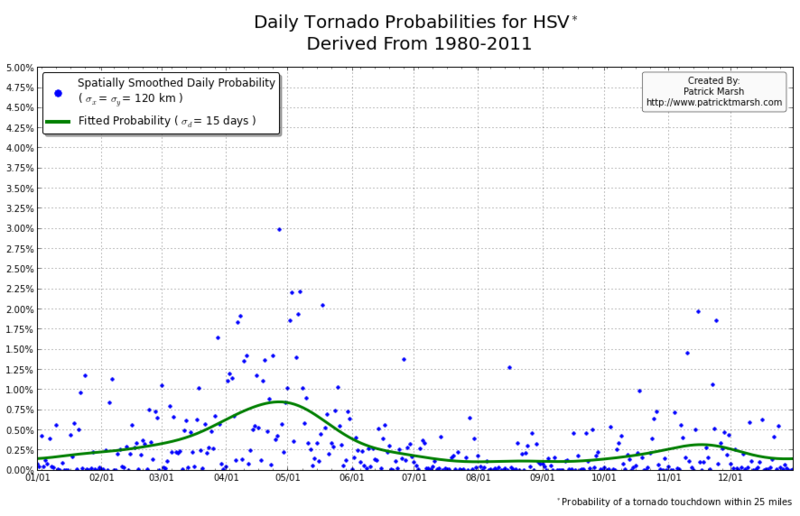 These time series were constructed using data from 1980-1999 and provided insight into the yearly cycle of severe convective hazards at individual locations. This allowed for assessing the risk/exposure to various convective hazards based on the actual climatology of a given area, rather than relying on the gross statistics of “Tornado Alley”. Unfortunately, Dr. Brooks’ data had not been updated to account for the additional decade of tornado data and thus was removed from the NSSL website. Updating this information has long been on my wish list; this week I decided to cross it off my wish list. As you can see, not every location has a single peak probability in the late spring into early summer. 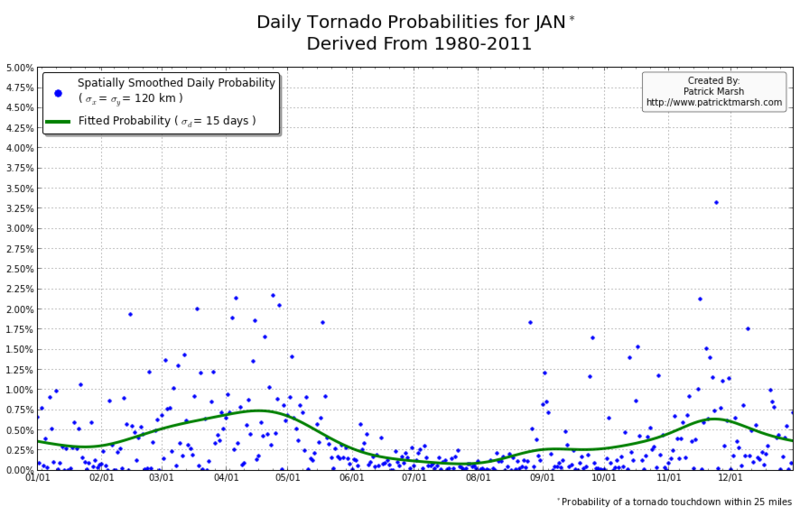 So called “tornado season” varies from location to location, even though the yearly risk/exposure (area under the green curve) are similar. The annual cycles are sorted into two groups to illustrate that the annual cycles for locations in the plains are different from those in the southeast. 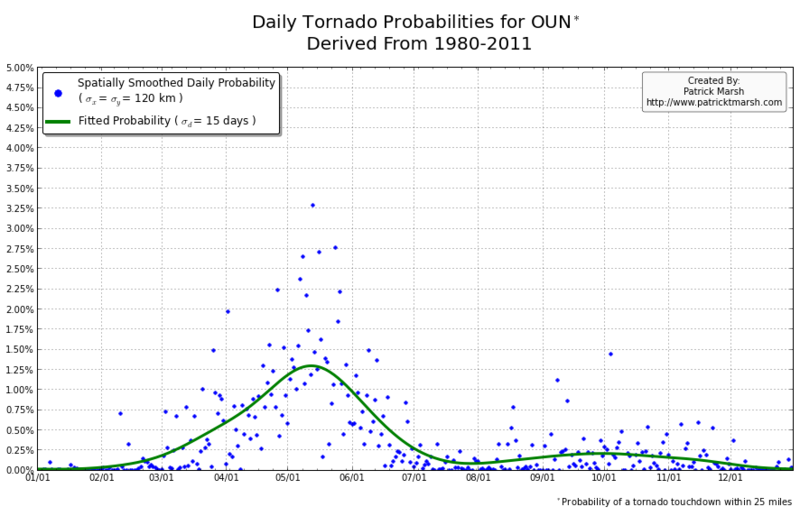 In the plains, the annual cycles have one predominant peak probability (which roughly corresponds with the US peak probability), indicating a well-defined “tornado season”. 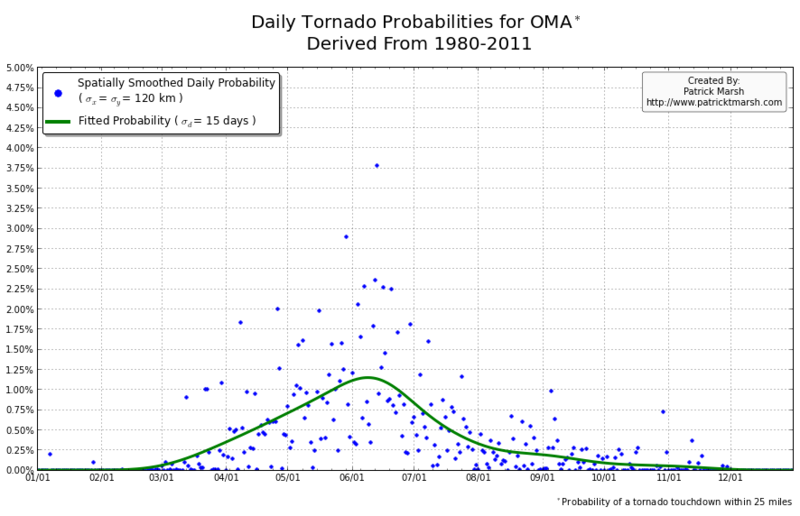 In the southeast there are multiple peaks — albeit each one smaller than those seen in the plains — but the off-peak probabilities are typically greater than the off-peak probabilities in the plains. So what does this all mean? 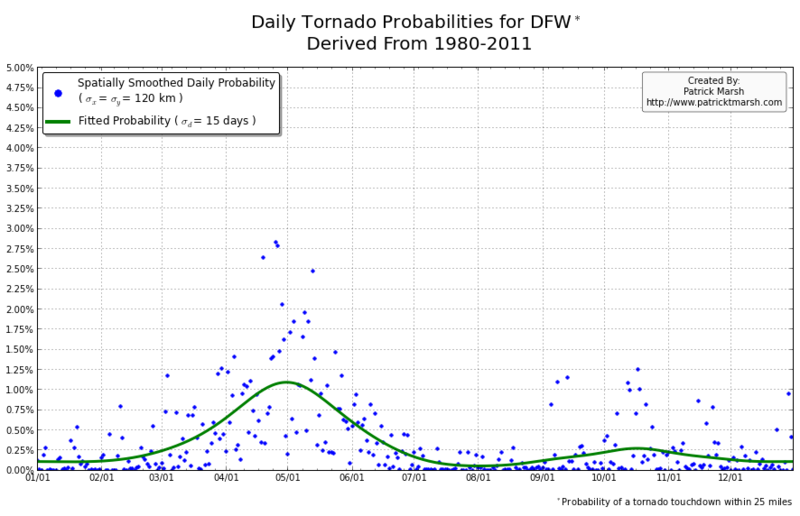 One’s climatological exposure to tornadoes is geographically-dependent. 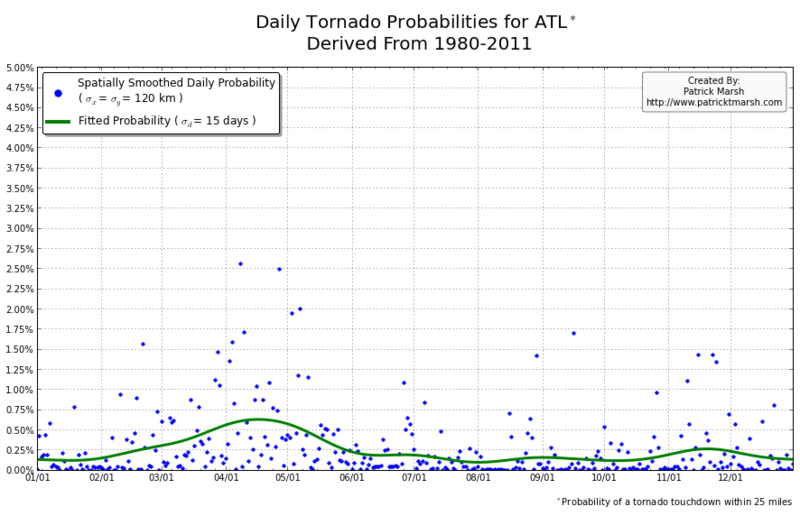 Another way to say this: “Tornado season” in the southeast US is fundamentally different than “tornado season” in the plains. 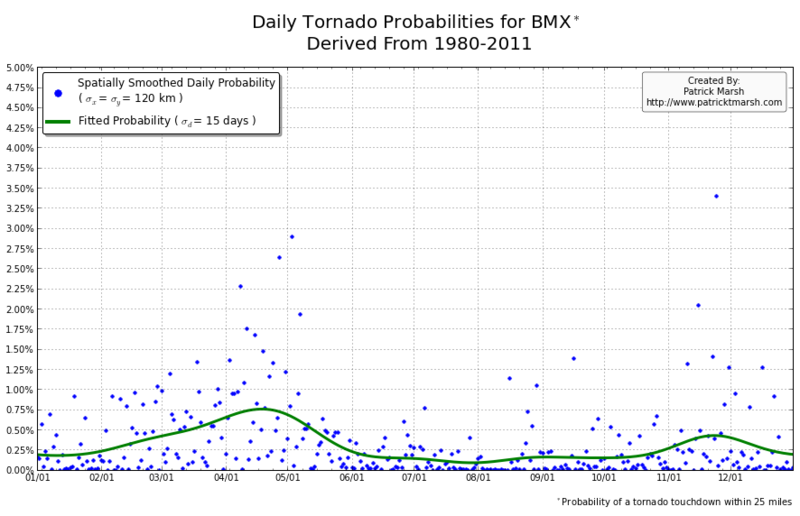 Persons located in the plains have a greater risk of a tornado developing within 25 miles of their location in the spring than they do any other time of the year. 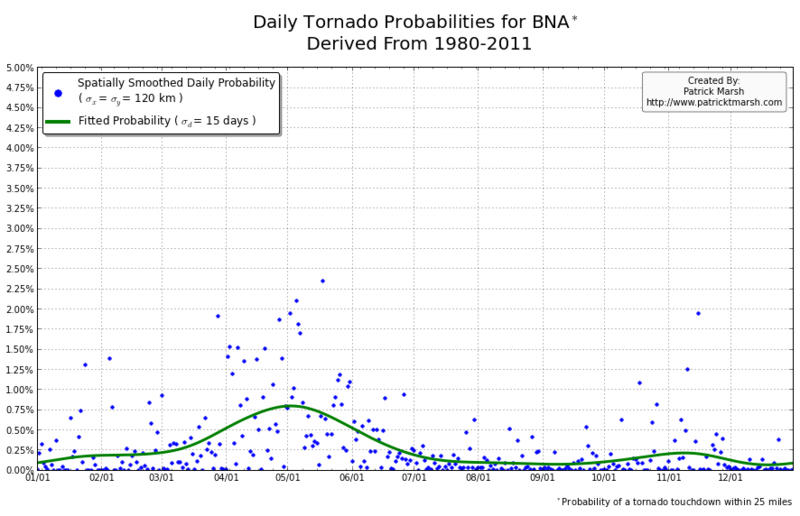 Persons located in the southeast have a relative small increase in probability in the spring/summer, but must be on guard all year as the climatological probability of a tornado never really approaches 0. 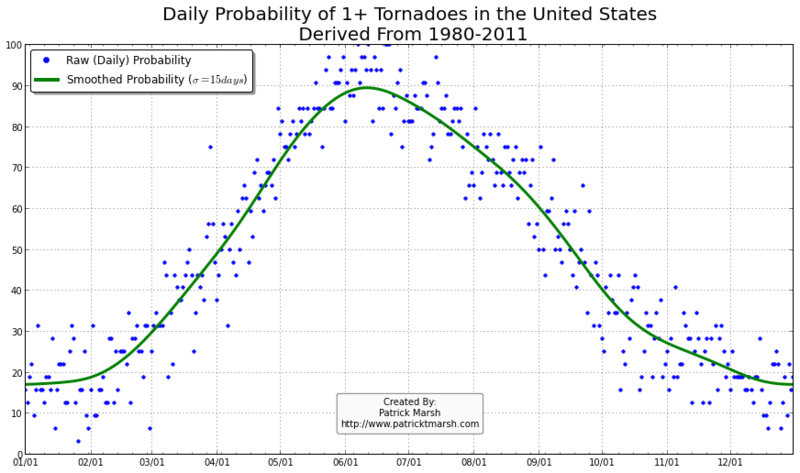 Update 2: Here is a video of the daily probabilities for the entire US. Please note that the standard resolution video is a bit degraded. For more clarity, please switch to the HD version.